There was a very interesting article in last week’s Time Magazine about William Chase and his family run farm in Hereford, England – basically from (almost) ruin he turned his family business on its head, from a bottom of the food chain, at the mercy of the supermarkets potato farm to a top of the food chain, won’t now deal with supermarkets (except Waitrose) Crisp / Potato Chip manufacturer. What has this got to do with digital out of home? Well, strange things occur when you keep your eyes peeled (get it? peeled?) and only last week we were filling up with petrol at an independent petrol station forecourt and we saw some very interesting branding going out on the Big Media Group digital screens there installed. We think that the Big Media Group could show the BPTV folks a thing or two – especially about innovation, thinking outside the box, entrepreneurship – we guess it is the difference between ‘corporate’ life and starting / running your own business – but we definitely like how Big Media Group has grown and what it has been doing recently. They basically approached Tyrells Crisps and are now running a set of trials with on screen advertising in Hereford and Worcester. Tyrells also, as you will see, from the Time Magazine article below, are maverick in the way they do business and willing to take so called ‘risks’ on new forms of advertising and branding. It’s great to see any brand do this and we would like to see and hear more similar stories. Tyrells for example are up against brands such as Walkers – owned of course by PepsiCo – a giant corporation who seems much less willing to give digital out of home a chance. Big Media Group are not stopping there either and are doing a similar set of trials for Whiskas cat food and Texaco’s Havoline lubricant (in the Texaco branded ‘independent’ forecourt installations that they have) as well as running adverts for Maynards Wine Gums and Cadburys ‘Snapples’. And finally they are running a number of Government messages for the Central Office of Information – things like “Take a Break, Tiredness Can Kill”, “Don’t Use Mobile Phones Whilst Driving” and some “Baby Seat” campaigns. Growing up in the rural town of Leominster in England’s Herefordshire County, William Chase always knew he would follow his father into farming. As a teenager, he worked on the family’s Tyrrells Court farm, and in 1984, at age 20, he bought the place from his father with a $400,000 bank loan. Heavily in debt from the start, the farm faltered, and the bank called the loan in 1992. Chase was forced to declare bankruptcy. Determined to make a success of his family legacy, Chase leased back part of the farm from the receivers until he could afford to buy it all back, eventually relaunching Tyrrells Court as a potato grower. By the mid-1990s, the farm was profitable, and Chase had set up a successful sideline as a consultant and broker between farmers and major supermarket chains. But when the supers started squeezing farmers on price by sourcing cheaper spuds from Eastern Europe, Chase knew he had to diversify. “It was time for something new,” he says. Finding inspiration in American-made artisanal chips, Chase hopped a plane to Boston to see how Cape Cod hand-stirred kettle chips were made. Munching his way through the U.S., he went to Pennsylvania’s Amish country, where “there are just loads of little chips makers.” After benchmarking the best, Chase returned to Tyrrells Court and began cooking. The first batches of Tyrrells Potato Chips reached stores in the summer of 2002, with four flavors: chili, cider vinegar, cheese and black pepper. Within eight months, Chase was turning over $2 million worth of business. 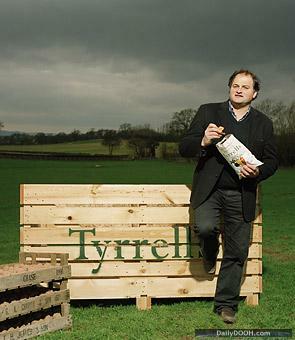 Within three years, Tyrrells was boasting sales of $10 million a year. None of those came from the major supermarkets who once pounded him on potato pricing: with the exception of Waitrose, the chips are stocked only in independent delicatessens and farm shops. The average order is just $300. When Chase found out last year that retail biggie Tesco was sourcing the chips through diverters, he squawked until the product was pulled. But retaining a sense of the local hasn’t stopped global expansion. Tyrrells boasts customers from Russia to China to the U.S., where Chase is amused that his brand is sitting on shelves next to the chips that inspired him. He’s a little disappointed that hit U.K. flavors like asparagus with crushed black pepper and duck with orange and ginger have been slow to catch on. “Americans really aren’t keen on the asparagus,” he says. Right ho, on that one. Chase recently found another way to turn a commodity into a premium product. He created an organic vodka “using the potatoes that are too small to be made into chips.” Once again he did his research in the U.S., visiting micro-distilleries. “We have this beautiful copper still from Germany. It is quite a laborious process, but the result is a farm-made, artisanal product, much like our potato chips.” No word yet on an asparagus-flavored version. This entry was posted on Thursday, February 14th, 2008 at 09:09 @423 and is filed under DailyDOOH Update. You can follow any responses to this entry through the RSS 2.0 feed. You can leave a response, or trackback from your own site.